Folks, it is my great privilege today to welcome back author Stephanie Osborn to the Elfyverse. Stephanie and I have known each other for several years, and she’s been a strong supporter of my writing from the get-go. But that’s not the main reason why I’m so happy to have her back today. Instead, it’s because she has a great new novel out called SHERLOCK HOLMES AND THE MUMMY’S CURSE. (Yes, when Shiny Book Review gets back up and running, I definitely plan to review her novel soonest.) And I asked her if she wanted to stop by and discuss her novel, and anything else she felt like talking about…thus this post, about why she adores writing about one of the world’s most beloved characters, Sherlock Holmes himself. I like Sherlock Holmes. Pretty much have, from the time I was a kid – though my first encounter with him was nearly my last. See, someone gave me a copy of The Hound of the Baskervilles for my birthday, when I was all of maybe 8 years old. I loved Holmes, but think about it: An 8-year-old kid with a vivid imagination, who dreams in color, and who has what would later be diagnosed as anxiety disorder, reading about a spectral cu sidhe that goes around killing members of an aristocratic family? Yeaaaaaah, no. It was years before I FINISHED the book, let alone picked up another Sherlock Holmes story. But when I did, I kinda went nuts. I discovered that big ol’ compendium – you know the one, with the mustard and rust colored dust jacket – in my high school library, and I checked it out and kept it until I read the whole thing, cover to cover. Twice. And then I wrote my first ever pastiche. …Which threw it out. First ever rejection notice and I wasn’t even out of high school. And it was a HIGH SCHOOL PUBLICATION. Problem was, the submissions were blind-judged – nobody knew who’d written anything – and the English Lit teacher, in her “superior knowledge,” decreed it was a direct, word-for-word plagiarism of one of Doyle’s actual stories. (No, she didn’t even try to check that big ol’ mustard-and-rust compendium.) At the end of the year, she discovered that I was the one who wrote it and she knew, straight-laced kid that I was, that I would never have plagiarized it. She also knew that I had the ability to write something like that. I don’t think the story was that great, to be honest. I didn’t at the time. In fact, today I don’t remember the name of the story, or even the plot. See, I was still learning how to put stuff like that together, and I knew there were some plot holes when I wrote it, though I disguised ‘em well. But it was still pretty good for a kid that age, if I do say so. I think the whole episode might say more about the teacher than about my story, but hey. And I watched the various and sundry films. I would have liked the Rathbone films better, I think, if Nigel Bruce hadn’t played Watson as a bumbling oaf; I simply couldn’t stomach that characterization, and it spoiled the films for me. Some years later, I discovered Jeremy Brett’s Holmes…and Holmes came to life for me. But I never tried my hand at another Holmes story. Until I was already in the whole writing/publishing milieu. I picked up an anthology of Holmes science fiction and loved it. I thought it was something I’d probably adore writing. But it was all Victorian, and I tended (at that time) to feel a bit limited by Victorian science. It’s pre-relativity, pre-quantum mechanics, pre-everything that makes modern science and science fiction so very…out there. And after all, I AM a scientist. Long story short, I worked out a way to bring a version of Holmes to the modern day from an alternate reality’s Victorian era, and The Displaced Detective series was born. Enter this guy named Tommy Hancock. Tommy happens to be the co-publisher and editor in chief of Pro Se Press, one of the movers and shakers in the New Pulp movement. Turns out he’s a fan of the Displaced Detective. So he approached me at a science fiction convention, and asked me to write Holmes for him – only he wanted a more traditional, Holmes and Watson in Victorian Britain, kind of story. So we sat down and talked. We decided what we’d do would be to create a prequel series to the Displaced Detective, so that alternate-reality version of Holmes would have chronicles of his past, with “his” Watson in his original continuum. And so the Gentleman Aegis series was born. 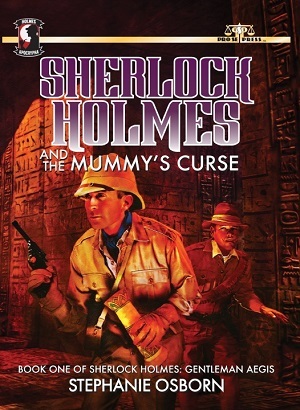 Book 1 of that series was just released: Sherlock Holmes and the Mummy’s Curse. So what is it about? I do hope you like it. I certainly had a great time writing it. Stephanie Osborn, the Interstellar Woman of Mystery, is a 20+-year space program veteran, with degrees in astronomy, physics, chemistry and mathematics, “fluent” in others, including geology and anatomy. She has authored, co-authored, or contributed to some two dozen books, including celebrated Burnout and the Displaced Detective and Gentleman Aegis series. « Where Have You Gone, Judith A. Lansdowne? Thanks for having me, Barb! Love it whenever I pop by and post for you! I’m always glad to have you as a guest, Stephanie. Stop by any time! Folks, I’m trying to add a JPEG to this, to show you the great cover, but I haven’t managed it yet…watch for that later today.